U.S. equity markets had a very strong first quarter, despite mixed results for March itself. For the month, the Dow Jones Industrial Average lost 0.60 percent, while the S&P 500 Index and the Nasdaq gained 0.12 percent and 1.57 percent, respectively. For the quarter, the Dow returned 5.19 percent, the S&P 500 was up 6.07 percent, and the Nasdaq, leading the way, climbed 10.13 percent. The strong performance in U.S. stock markets was due to continued economic growth and consequent earnings growth. Per FactSet, as of March 31, the estimated average earnings growth rate for the S&P 500 during the first quarter is 9.1 percent. If the figure proves accurate, this would mean the highest year-over-year growth since late 2011 and mark three consecutive quarters of earnings growth. Markets respond to growing earnings, which is just what we are seeing. Technical factors remained positive for all three indices during the month and quarter, with all staying well above their 200-day moving averages since the November election. Investor sentiment continues to be bullish. International equity markets also had a strong start to 2017, with faster economic growth and decreasing political risks boosting investor sentiment. The MSCI EAFE Index, which represents global developed markets, returned a healthy 2.75 percent in March and 7.25 percent for the quarter. The MSCI Emerging Markets Index was also up, gaining 2.55 percent for the month and an impressive 11.49 percent for the quarter. Both indices benefited from the first synchronized global economic upswing since the financial crisis. Technical factors were also supportive for both indices, as they remained above their respective trend lines. Fixed income indices had a volatile start to 2017, due largely to uncertainty surrounding whether the Federal Reserve (Fed) would increase the federal funds rate in March. It did, of course, and the Bloomberg Barclays Aggregate Bond Index experienced a 0.05-percent loss for the month, though it gained 0.82 percent for the quarter. During much of the three-month period, the 10-year Treasury yield traded in a window between 2.30 percent and 2.60 percent, with changes in interest rates dominating investment performance. The Bloomberg Barclays U.S. Corporate High Yield Index declined 0.22 percent in March, though it was up 2.70 percent for the quarter. High-yield performance for the period can be attributed to improvements in the lower-credit-quality sector of the index and to spread compression, which left spreads at extremely low levels by quarter’s end. Data throughout the first quarter showed economic growth carrying over from the end of last year, as estimates for fourth-quarter gross domestic product growth were revised upward, from 1.9 percent to 2.1 percent. With a solid start to the year, and strong data since then, the economy continues to improve. The Fed acknowledged as much when it increased the federal funds interest rate by 0.25 percent at its March meeting. Given strong job growth in the first two months of the year, as well as increases in inflation to target levels, the Fed had almost guaranteed an increase ahead of time. The actual hike, along with suggestions that more were on the way, showed that it believes the economy is strong enough to withstand a return to a more normal interest rate environment. As of quarter-end, the market expects two more interest rate hikes this year. Improvement in the economy has also resulted in increased levels of business and consumer confidence, which in turn have helped to drive more improvement. Manufacturing and service sector confidence is about as high as it’s been since 2011 (see Figure 1). 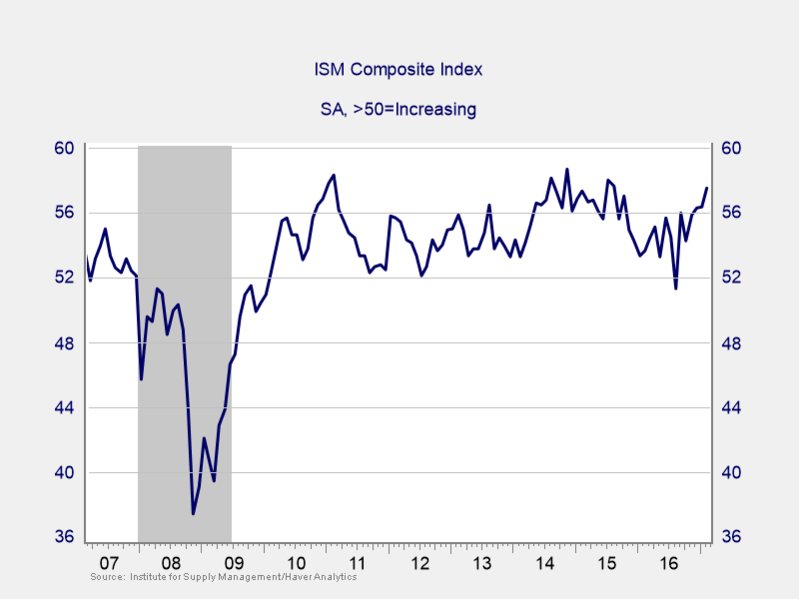 The ISM Composite Index has improved steadily over the past six months and is now above 2007 levels. Additionally, durable goods orders are growing at a healthy pace, with headline orders beating expectations as businesses invest in long-term productive assets—also a sign of increased confidence. On the consumer front, the major confidence gauges remain near highs last seen in the early 2000s, with the Conference Board figures in particular registering surprising increases. Consumers have consistently kept these headline numbers strong since the November election, and recent political uncertainty and minor volatility in equity markets have not rattled them. Confidence at these levels has historically generated faster spending growth across the board, and healthy income growth means that consumers have the money to spend. Unfortunately, we are not seeing that yet. Personal consumption spending growth came in lower than expected during March. Much of the shortfall, however, was due to abnormally warm temperatures, which decreased spending on utilities by double digits for the second month in a row and therefore depressed spending as a whole. Although the high levels of consumer confidence and personal income growth suggest that spending is likely to rebound, this is something we need to keep an eye on. Confidence is one thing, actual results are another, as shown by the spending data; overall, however, we had positive results from both in the first quarter. Jobs, which impact consumer and business confidence alike, have grown much faster than expected in the first two months of 2017, and wage growth has improved. Job growth, coupled with rising pay, has historically been a principal driver of increased consumer confidence, in addition to indirectly signaling improved business confidence. You don’t hire if you don’t think the future will be better. Housing has also continued to grow, with improvements in home builder sentiment surprising to the upside. The National Association of Home Builders/Wells Fargo Housing Market Index surged in March to levels not seen since 2005, as rising demand and supply shortages led to faster growth in housing starts and to new home sales beating expectations. Existing home sales declined slightly during the month—a result of strong demand eating up supply and leaving levels at the lowest they’ve been in the 34 years that this data has been collected. Low supply is a problem of economic strength, not weakness. With the economy improving, here and abroad, the major risks have been political. In the U.S., the Trump administration and Republican Congress have been slower to enact policy changes than expected, with the collapse of the health care reform process a particular surprise. Accordingly, expectations for further policy changes have come down, making investors more cautious about the prospects for tax reform. The uncertainty may constrain further market gains. On the other hand, because the market remains at very high levels, the hope for successful tax reform is still alive, which could provide a boost to confidence and markets. Nevertheless, investors are taking a wait-and-see approach. In Europe, pending elections had kept markets in a state of concern. But, during the first quarter, the success of moderate parties over nationalist candidates in the Dutch elections served to calm them. Polls showing a likely win for moderates in the French election indicated that political risks were starting to abate there. Finally, the formal two-year Brexit process began without drama, resolving another source of uncertainty. Risks remain, but the political environment appears much more stable than it did at year-end. Turning to Asia, although tensions have increased following new North Korean missile testing, the U.S. and China are taking a less confrontational approach. Reduced tensions should help mitigate risks between those countries as well. The meeting between President Trump and China’s President Xi in early April should also help resolve some concerns. After a strong first quarter, the good news seems likely to continue. The economy is still improving, and much of the policy uncertainty that served as a headwind in the first quarter may be subsiding. Additionally, as growth resumes around the world, we are in the first synchronized economic expansion since the financial crisis. Moreover, the resilience of the U.S. economy and the strong performance of financial markets during the first quarter suggest that many risks have already been priced in. That said, of course, risks remain. The biggest is that economic expectations will adjust down on weaker data and that the present improvement will roll over. Other significant risk factors are political. Still, given the past steady improvement in the economy and the return of corporate earnings growth, conditions for the economy and financial markets are as supportive as they have been since 2008. As always, despite potential setbacks, a well-diversified portfolio that matches your goals remains the best way to prepare for the future. Authored by Brad McMillan, senior vice president, chief investment officer, and Sam Millette, investment research associate, at Commonwealth Financial Network®.